With only a week remaining before we take off on our next adventure, I’ve been thinking about the lessons I learned here in the northern forests of Ontario. The biggest lesson I learned is that practical skills have to be practiced. When I moved here, I thought I was well-prepared and self sufficient. Spending a year here taught me how little I actually knew. We got the opportunity to give up city life and move to a rural area of Ontario, on the outskirts of Algonquin Park. When the chance arose, the timing was a blessing – we were dealing with the loss of my daughters’ father. He had recently passed away very suddenly, leaving our family heartbroken and grief-stricken. My oldest daughter was moving out on her own, so my youngest and I jumped at the chance for a change of scenery, living the prepper’s dream of isolation, natural resources, and a self-reliant lifestyle. Because I work from home, there was no search for a job. My daughter is a little adventure-seeking gypsy too, so we enthusiastically committed ourselves to a year in a lakeside cabin on the edge of a vast wilderness. When my daughter and I moved here, we had the prepping mindset, but we were city girls. Our wilderness experiences were based on day hikes and Youtube videos. We’d made the occasional backyard bonfire with wood purchased at a local grocery store. We dealt with a power outage due to bad weather perhaps once a year. We lived in a place where anything we might need was within walking distance and where you could stretch a skipping rope in the distance from our house to the neighbor’s house. Within two weeks of finding the cute little rental cabin, we were in a U-haul loaded to capacity, towing our truck behind us, and slowing down for a young bear to cross the road in front of us. We arrived in the summer, and life in the boondocks is always easier in a temperate climate. We located all sorts of wild fruit in the 23 acres of forest behind the cabin and put up jars of it for the winter ahead. We hiked, explored, and set out in a canoe on pretty much a daily basis. I sat there on my deck every morning, overlooking the lake and working on the laptop. Life had become a coffee commercial. My daughter and our younger dog spent more time in the lake than on dry land. As fall approached, we ordered a load of wood, and that’s when the real work began. As a newbie, I got the load already split, and it’s a good thing, because there’s no way I would have gotten enough wood for the winter ready otherwise. Six loads of wood the size of the picture below were unceremoniously dumped in my driveway. This, of course, had to be stacked immediately, and covered with a tarp to keep it dry. A city-style gym workout does not compare to stacking six cords of wood. As fall approached, sadly, we lost our beloved dog Katie, our 14 year old Schnauzer. We buried her out in the forest that she got to enjoy in her last days. This is when I learned how terribly difficult digging in the woods is – you hit roots constantly, and I actually broke the first shovel I used. 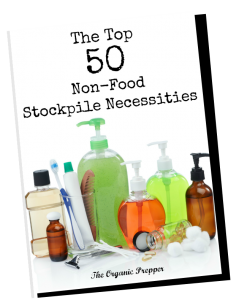 Many preppers have plans to create a dug-out for shelter or to dig a latrine in the woods. If you haven’t tried digging a hole in the forest, I strongly suggest you do so – you might rethink your plans. By October, the spectacular surroundings became even more breathtaking. Everywhere you looked was ablaze with color. Almost overnight, it went from summer to autumn, with shorter, chillier days. I finally got all the wood stacked, and got some brought inside. I had the wood stove chimney cleaned and did lots of canning. There is a small, expensive grocery store here in town. To go to the larger grocery stores or department stores, the drive was an hour and a half to the nearest town of about 10,000 people. Obviously, that isn’t a trip to be undertaken frequently when the weather is bad, so a bit of stockpiling is a way of life around here. My daughter got a longbow as a birthday gift from a good friend of mine. Because of our relative isolation, we were able to set up a target right in the field behind the house and practice our archery skills daily. We both learned to use a bow and arrow with considerable accuracy, a skill that is a bit unusual in this day and age that could become invaluable in the future. It finally got cold enough that a fire was needed to take the chill off in the evening. I had made some backyard fires for roasting marshmallows, but building a fire in the wood stove that lasted was a whole different story. That’s when I learned how green I really was. The first major lesson I learned was that starting a fire is easy – keeping it going is another matter. I emailed back and forth with friends who had more experience than I, and began to really worry that my daughter and I were going to freeze to death over the course of the winter, since that little wood stove in the living room was the only source of heat in the cabin. It took me a solid month before I was able to consistently build a blazing fire and keep it going. A few readers scoffed at my ineptitude, but I don’t want to be misleading and make people think that all this homesteading-in-the-wilderness stuff comes easily. Perhaps it does for some people, but for me, it took making a lot of mistakes to learn to do things properly. Luckily I had a couple of months before deadly freezing weather arrived during which I could master this skill – but if your plan is to bug out and heat with wood, my suggestion is to practice now, as often as possible, because it isn’t as easy as throwing a match on a pile of logs. Our next challenge was dealing with a low well. A dry summer had caused the water table to be extremely low, and thus we had very little water to draw from our well for household usage. This also meant that the water coming from the taps was dirty and silty. We bought big jugs of spring water for cooking and drinking. I rigged up a little filter to put under the tap in the kitchen in order to wash dishes and clean, with a coffee filter and a mesh colander. Because of the high water usage of a washing machine, we had to do our laundry off-grid for a couple of months – also a tremendous amount of work. My best advice for off-grid laundry is to invest in an industrial style mop bucket with a wringer – it will save you lots of effort and help your clothes to dry much faster then just wringing the clothing out by hand. Then there was the shaky grasp on electricity. Throughout our time here we had no less than one power outage per month, and sometimes more. After the first couple of outages, we learned some ways to streamline our power-outage process. The biggest challenge was that our pump ran on electricity, so no power = no water. At the first sign of high winds, we immediately filled the bathtub to provide us with water for flushing. We organized a box of power outage entertainment, complete with card games, dominoes, puzzle books, and craft supplies. We located candles decoratively around the house, and kept matches near them. We kept a “display” of solar lights in a decorative planter on the deck. When the power went out, we could just go grab the fully charged lights and place them in vases for extra lighting. We got a cast iron Dutch oven for cooking on top of the woodstove. I got a lockable storage bench for the deck to use as a back-up fridge/freezer depending on the outdoor temperature. Pretty soon, power outages were no big deal at all. The longest one was three days. We were cozy, entertained, and well-fed. The biggest inconvenience for me was being unable to work or communicate, since my internet was dependent on electricity and we had no phone service of any kind at the cabin. Our first snow was really exciting. Of course, living in Canada, we’d had snow before, the the magical glorious snow coating the forest and the lakeshore made it seem like we were living in a Christmas card. Our winter hobby was learning to identify tracks in the snow. It was interesting that during our walks through the woods we rarely saw any animals aside from chipmunks and birds. However, a fresh snowfall made for plenty of evidence that the forest was well-populated with many unseen neighbors. The cabin was not well insulated, we discovered. We had to take numerous measures to stay warm when the temperature dipped down to seriously frigid temperatures like -36. Our biggest snow was three feet. The howling wind blew so much snow against our door that we had to climb out the bedroom window and dig our way back into the house. We learned then the valuable lesson of storing a snow shovel inside, since we couldn’t find our shovel until after we dug our way to it using various improvised household substitutes. The snow lasted from November until April. By January the lake was frozen over solidly and we could walk the entire length of it. Bringing in wood during the winter was not the most fun activity in the world. Your boots made the floor wet and slippery, and the loads seemed heavier when you had to trudge through the snow to carry them in. We had the whitest Christmas we’ve ever had, and actually ended up snowed in for 4 days around the holiday. Luckily my older daughter arrived before the snowstorm did, so we had a lovely holiday together, cozily ensconced in our lakeside cabin. A friend pointed out to me that it was important that I teach my daughter the ins-and-outs of keeping the fire going. Initially I was worried that she’d get burned and I wouldn’t let her add wood to the stove, more less light the fire. But he made the excellent point that if something happened to me, with our isolation, her life could depend on her ability to make a fire and keep it going. By the end of winter, little 12 year old Rosie could build a blazing fire and cook a meal on top of the wood stove with an ease that would make most adults jealous. From this, I learned that despite some risk, it’s also important to let your kids make mistakes so that they can learn self-sufficiency too – you can’t protect them from life. The advent of spring is very different in the North. It sneaks up on you. The temperatures are a little bit warmer and you can go outside without feeling the insides of your nostrils flash-freezing. There are more tracks in the snow, proof that the animals are waking up and getting busy. You begin to see darkening thin patches in the ice that covers the lake. By April we never wanted to see another flake of snow. It even snowed on my birthday during the first week of the month. Although the basic covering of snow melted, we still had snowfall occasionally throughout the month of May. However, the weather had warmed up, the roads were nice and clear, and we were able to spend lots of time outdoors again – such a relief after being cooped up for the better portion of the day for the previous six months. By the beginning of June, the weather had gotten warm (at least for this area). Wildlife was everywhere – just driving through the park, you might meet any number of animals. The lake finally melted and the dog is once again able to chase ducks in the water, then roll in the dirt. The woods behind our house are alive, lush and green. The downfall to spring in this area is the vast amount of bugs. Mosquitoes and blackflies will eat you alive if you stand still when you are outdoors. Natural solutions like lavender oil or Avon’s Skin So Soft work well to defend you against mosquitoes but nothing seems to work against the blackflies. There is nothing that is so great a learning experience as living the life. 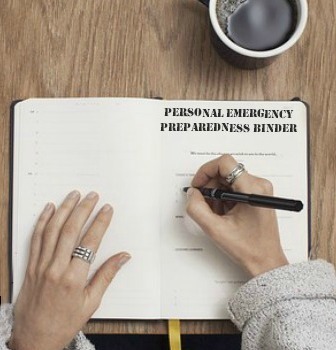 No amount of books, websites, Youtube videos, or classroom-imparted information can prepare you like actually getting out there and immersing yourself in a self-sufficient or survival lifestyle. If you’re anything like me, you’ll make newbie mistakes, and that’s okay. Most of us have not lived a life that prepares us for survival and the only way to get prepared is to actually perform these tasks. Grow your food, chop your wood, and practice off-grid skills. Right now, you have back-up as close as the switch of your thermostat or the nearest grocery store. Make your mistakes now, while these things aren’t a matter of life and death. Not only will the practicing of these skills make you adept at them, but the accomplishments will give you the confidence required to overcome fear and thrive during challenging times. I’m not suggesting that everyone has to give up their home and go live in a cabin in the woods in order to survive the future. However, you have to push yourself beyond the lifestyle that most of us live today. You have to practice going without water running from the tap or providing your own heat. You have to immerse yourself in what it means to live in a different way. If a city girl like me can learn these things, anyone can – they just have to be willing to inconvenience themselves. You’ll definitely make mistakes along the way, but from those errors will be born a knowledge that can only come from experience. Canada has been my home since I was married 18 years ago. This beautiful, gracious country welcomed me and will always be dear to me. I will leave a little piece of my heart here, with my dear friends and family, in this place that I love. But there’s no place like home, and now we’re off on our next adventure, moving to a little organic farm in the Pacific Northwest of the United States. I am excited about the challenge of learning to produce our own food on a much bigger scale and learning to keep livestock. We’ll be surrounded by good friends and we’ll learning a new set of skills in a completely different environment. The mistakes I’ve made over the past year and the lessons I have learned from them in our little northern cabin have given me a platform of competence and confidence with which to take on this next set of experiences. What Will You Do When the Lights Go Out? EMP: An Elaborate Hoax or a Legitimate Threat?